when you touch the bulb with your bare hands, clean the bulb with a cloth moistened with alcohol or soap water to prevent premature bulb failure. Remove the turn signal light assembly. Remove the socket (1) by turning it counterclockwise. 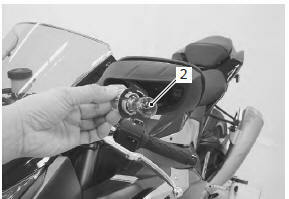 Replace the front turn signal light bulb (2).